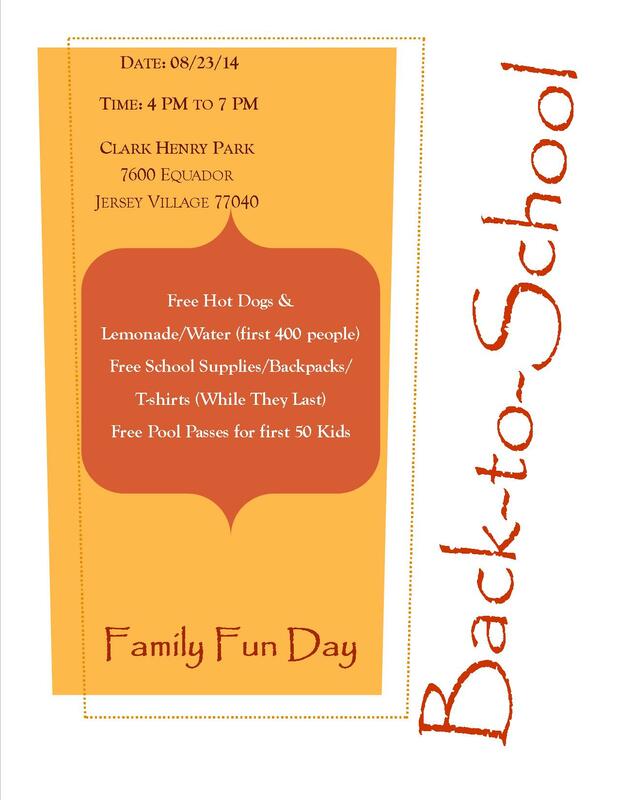 This entry was posted in First Met Event Previews and tagged 2014/2015, Back to School, cfisd, Family Fun Day. 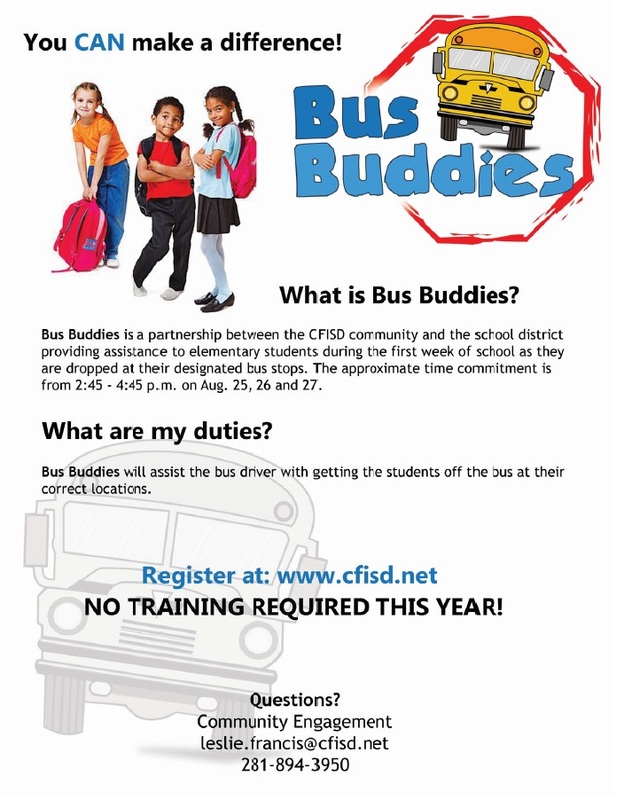 This entry was posted in First Met Event Previews and tagged 2014/2015, Bus Buddies, cfisd, Cy-Fair ISD. 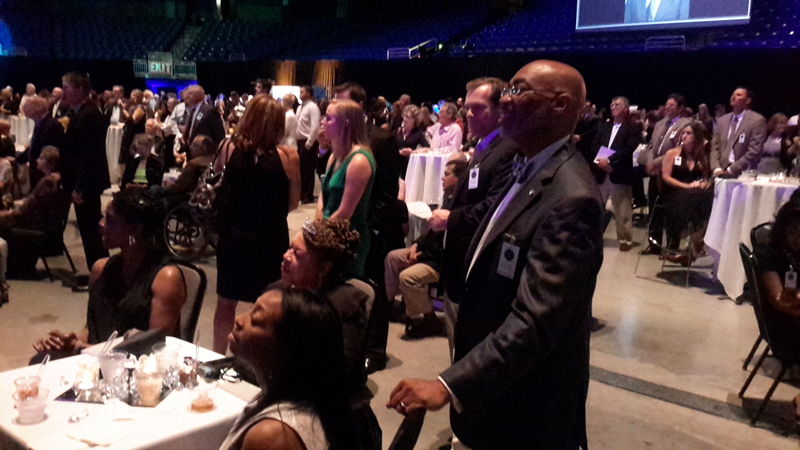 August 9th, Pastor O was honored as one of Cypress Fairbank ISD’s top 75 most influential people. 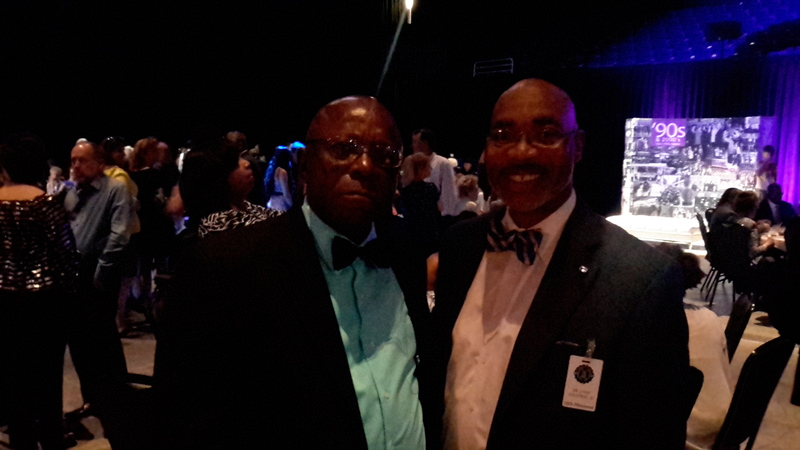 Dr. John Ogletree, Jr has been a community presence in CFISD even before his election to the Trustee Board in 2003. His desire to be and create life long learners has fortified the board, ensuring that not only academic excellence is pursuid, but ghat civil injustices are haulted and the equality of all students and educators exist. Dr. Ogletree has solidified himself as one who stands for all people, giving a voice to all who are and or have been kept silent. It’s been said that those sitting at the table write the story, and thus Dr. Ogletree has taken his seat , serving as an editor of editors, correcting grammatical mistakes, and helping the readers and audience take ownership by making them feel one with the authors. The acknowledgement wrote of Dr. Ogletree recorded, “Enthusiastic in his role, Ogletree attends many district events,-one may encounter him in an athletic apparel at the Super intended Fun Run or in formal business attire at a Rigor, Relevance, and Relationship professional development seminar…earning the designation of Master Trustee.” The night was filled with music and the fellowship of of other honorees, family members and church members united to celebrate the district and to give thanks to the top 75 that have served and sacrificed to ensure that CFISD remains a model district and one of the top districts in the state of Texas and the world. We are blessed to have such a leader as Dr. Ogletree! He has demonstrated the love of Christ in his service at the church and also in the community. His understanding of the Gospel and his demonstration of the Word should inspire all to impact the community it at large, placing Christmas on the main stage as a part of every discussion. 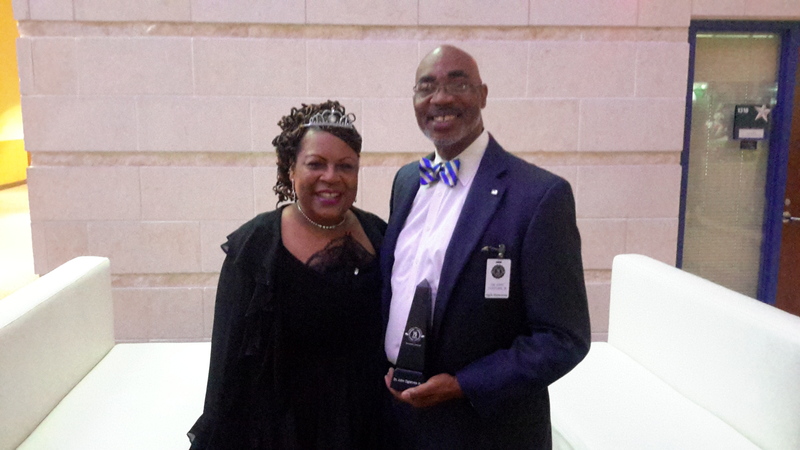 First Met congratulates our amazing leader, Dr. Joh D. Ogletree, Jr. As a Top 75 Influential Leader. This entry was posted in First Met Event Reviews, First Met Member Highlights, Our Pastors and tagged cfisd, Honoree, Influential, John Ogletree, Jr., Pastor O. 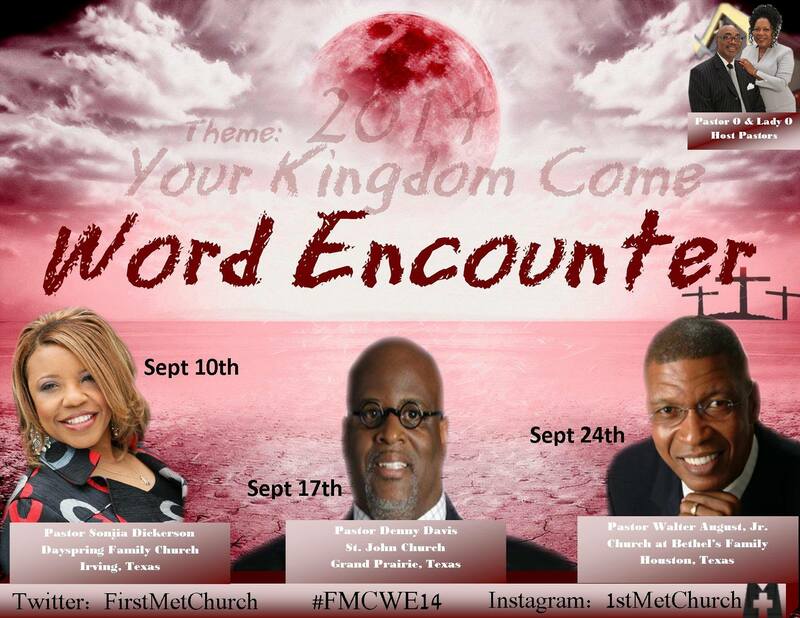 This entry was posted in First Met Event Previews and tagged Denny Davis, FirstMetChurch, Fresh Wind, Pastor O, Sonjia Dickerson, Walter August, Word Encounter. 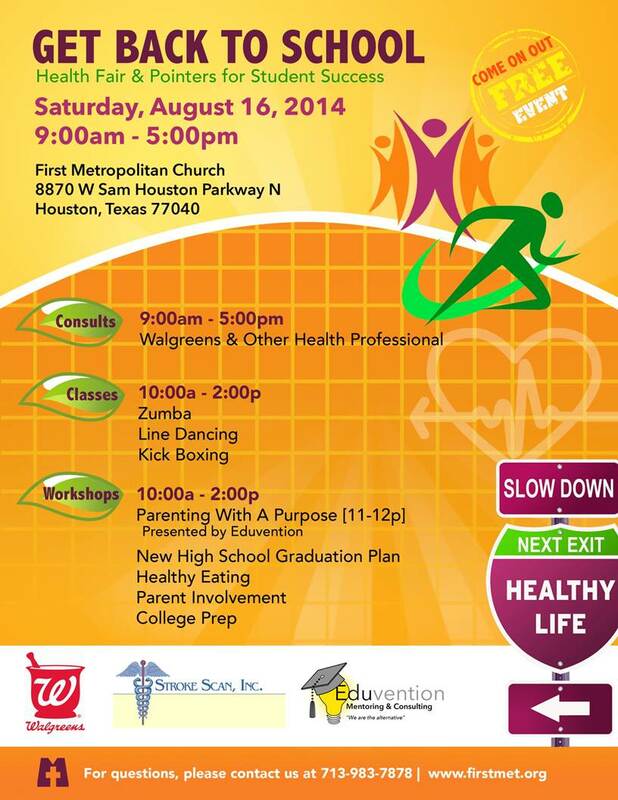 This entry was posted in First Met Event Previews and tagged Back to School, Eduvention, FirstMetChurch, Health Fair, Pastor O, Swing Dance, Workshop, Zumba. Saturday, August 2nd, the Save Our Son’s ministry (SOS) had its summer fellowship close out. 16 young men gathered to participate in some fun in the sun at the Redemption Park located on West Greens Rd. 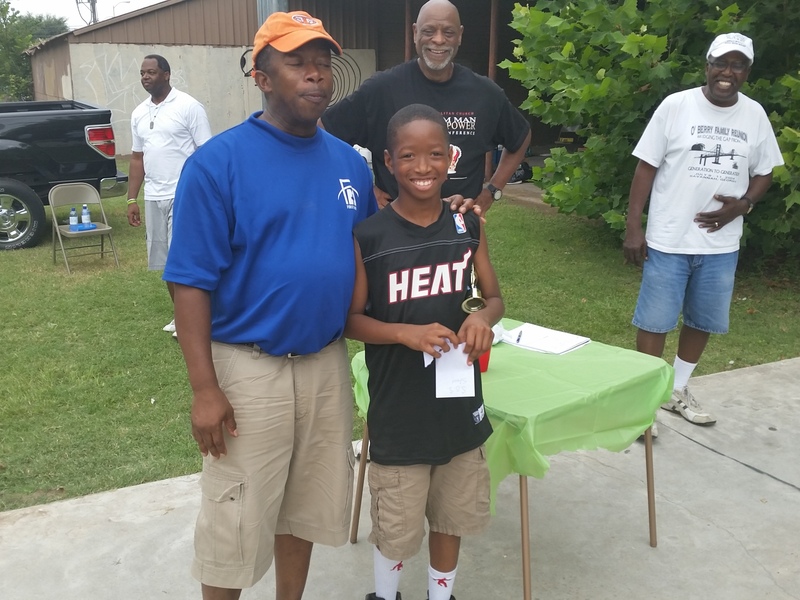 The fun was provided through healthy competition in a 3 on 3 basketball tournament, which allowed each young man to show both their skills, and the important social and spiritual lessons they have been taught during their time in the ministry. Each young man gave their all, entertaining all playing and wall spectating. The team called the Thunder won the tournament. It’s members Jaylen, Christian and Neeland, showed their individual abilities, but won the tournament working as a team. In second place were the Clippers, whom included Kendall, Kendon and Caleb. The young men then were honored with an awards ceremony. 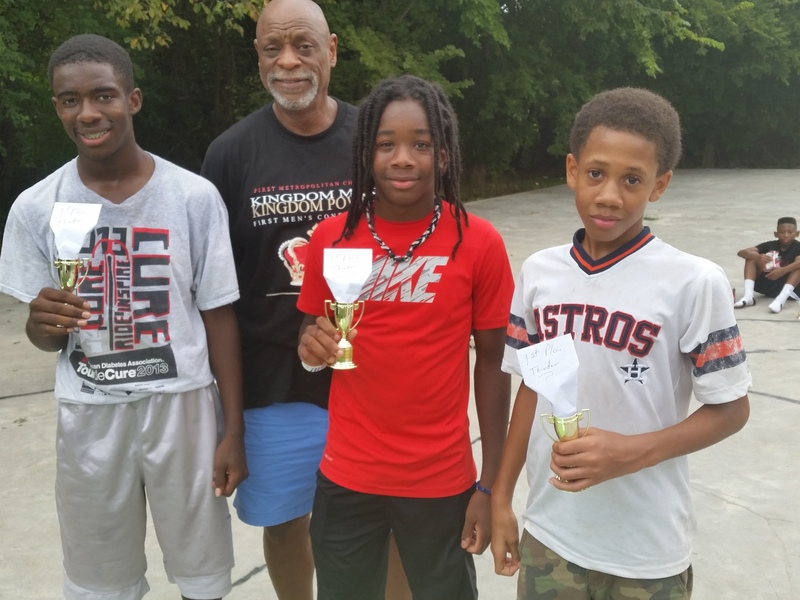 Each of the top 3 teams received a trophy, and honorable mentions were given to Jeremiah Franklin, Jeremiah Hill and Andre whom all received gift cards for their play and for the character they displayed while playing in the tournament. While there, they enjoyed grilled hot dogs, hamburgers, chips, water, and soda. The SOS ministry meets on Wednesday Night at 7:30 pm during Transformation night. To participate, contact Brother Darrell Franklin. This entry was posted in First Met Event Reviews and tagged 3 on 3 Tournament, Basketball, Pastor O, SOS.